Long term care is something you may need if you can no longer perform everyday tasks by yourself. For example, there may come a time when you need help getting dressed, eating or bathing. It also includes the kind of care you would need if you had a severe cognitive impairment like Alzheimer’s disease. 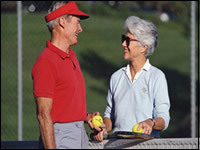 You can receive this care in a variety of settings, including your home, an assisted living facility or a nursing home. The need for long term care usually arises from age or chronic illness, injury or disability. In fact, approximately 60% of us who reach age 65 will need long term care at some time in our lives.1 But it’s not just a retiree’s issue. Many people don’t realize that the need for long term care can strike at any time. Statistics show that 40% of people receiving long term care services are working age adults, between the ages of 18 and 64. Would you be prepared for long term care, if you suddenly required it? Long term care is the type of care that you may need if you can no longer perform “activities of daily living” by yourself, such as eating, bathing or getting dressed. It also includes the kind of care you would need if you had a severe cognitive impairment like Alzheimer’s disease. Care can be received in a variety of settings, including your own home, assisted living facilities, adult day care centers or hospice facilities. Long term care isn’t the type of care that you receive in the hospital or your doctor’s office. It isn’t the medical care you need to get well from a sickness or an injury. It isn’t short-term rehabilitation from an accident or recuperation from surgery.